Back to reality… we continue on to the San Diego Maritime Museum, a world-class collection of historic ships and artifacts. 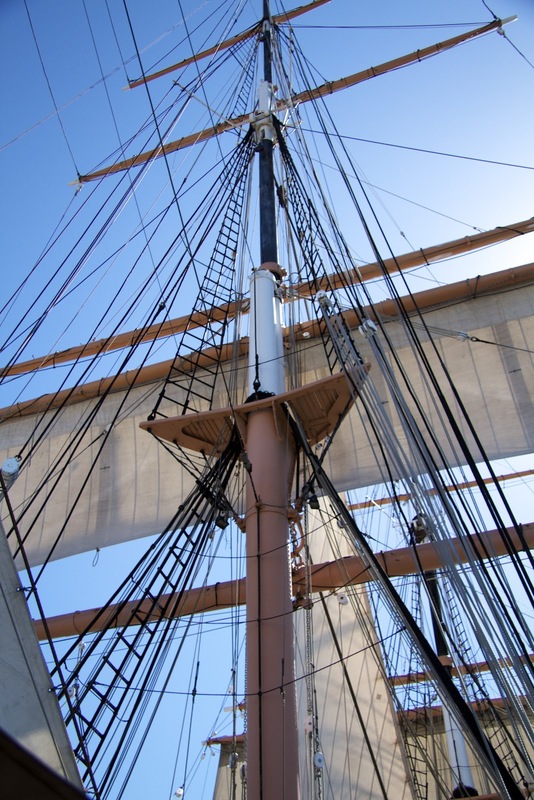 The Star of India is the world’s oldest active sailing vessel. There are fascinating exhibits outlining the life of the sailors and passengers onboard. 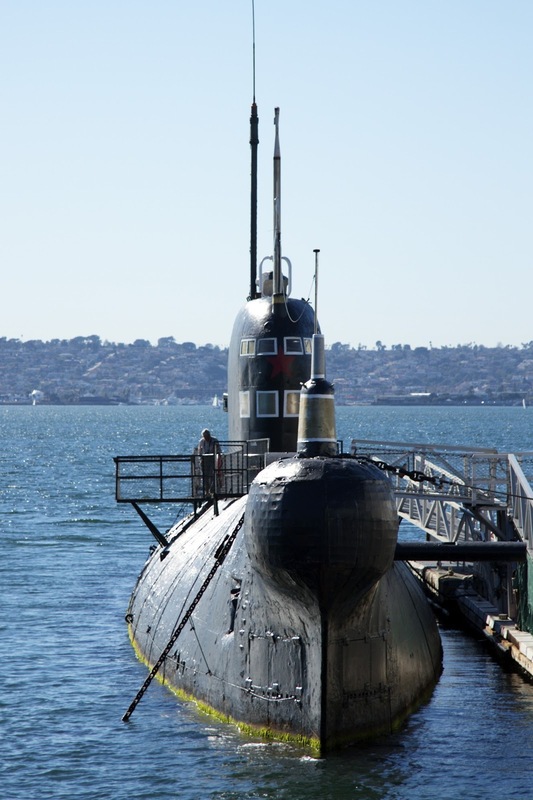 Two submarines give us insight into cold war nautical life. The Russian B-39 is down right Spartan and crudely constructed, which makes sense considering that; if this sub ever deployed one of it’s nuclear torpedoes, the shock wave would have obliterated the sub. 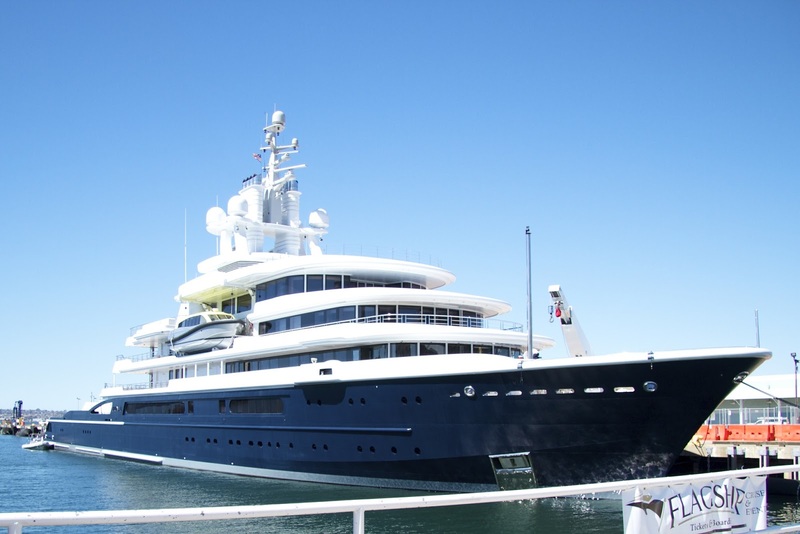 The USS Dolphin by comparison is downright luxurious with lots of stainless steel and smooth surfaces. The Steam yacht Medea takes us back to an age of elegance on the high seas and the steam ferryboat, The Berkeley presents commuting in style. The Cabrillo National Monument is located at the entrance to San Diego Harbor on Point Loma. This is supposedly the place where, in 1542, the Portuguese explorer, Juan Rodriguez Cabrillo landed and “Gave the world California.” There are tide pools, lighthouses and incredible views of the harbor and city skyline. 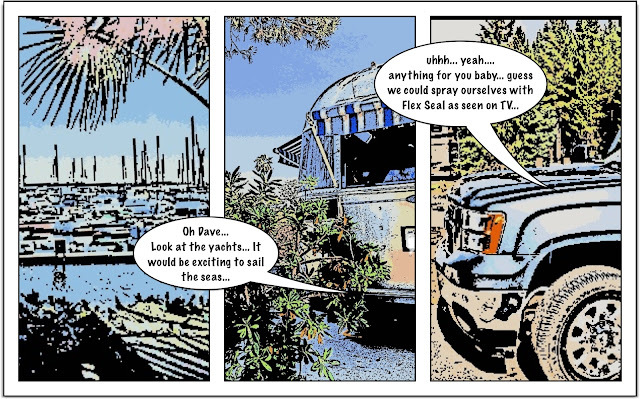 We watch a modern nuclear sub exiting the harbor. She slowly moves along the channel and out to sea. 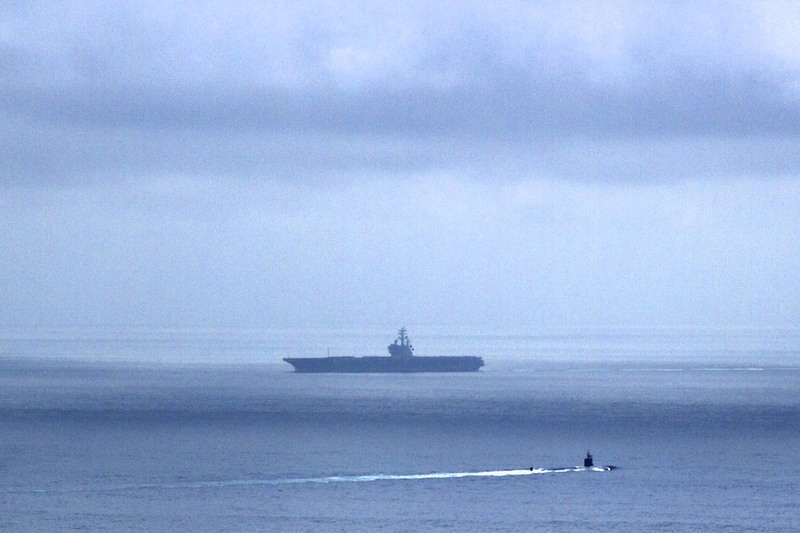 On the horizon we view the aircraft carrier, the USS Ronald Regan returning from Washington State. As the carrier enters the mouth of the harbor, the sailors stand at attention along the rail in their dress blue uniforms. The flight deck is deck covered with the vehicles of Navy Sailors. At a cost of about $4.5 billion this is probably the world's most expensive parking lot. It may seem a bit odd, but this is actually a common occurrence for the Navy and a lot cheaper and easier than transporting the vehicles almost any other way. 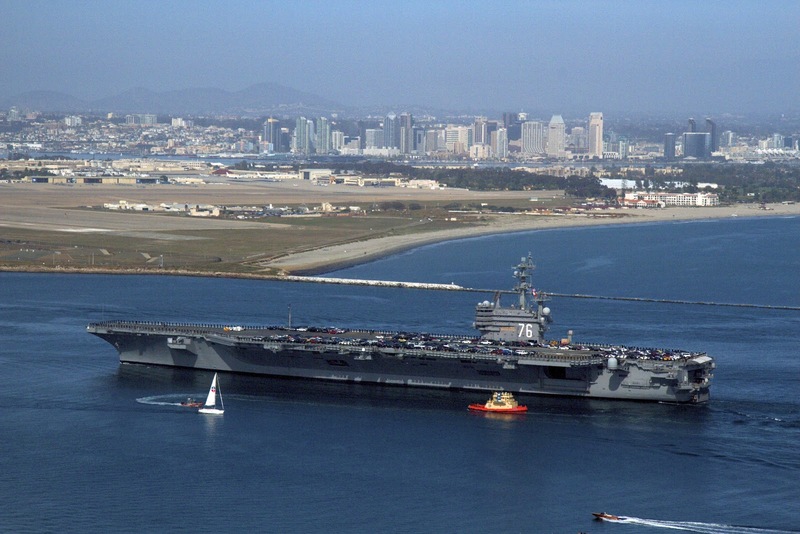 For us San Diego harbor is a wonderful tourist location, but this is also a major Naval installation and the military industrial complex fuels 26% of the area economy. The San Diego area is home to a plethora of casual and fine dining establishments and although it could be an interesting challenge to dine our way up and down the coast… realistically, neither our pocketbooks nor waistlines are up to the challenge. However, we make a concerted effort to experience and taste some of the local culinary offerings. Since we are spending a couple of months in the area, we can stop first for cocktails and if our expectations are exceeded, return later for a meal. 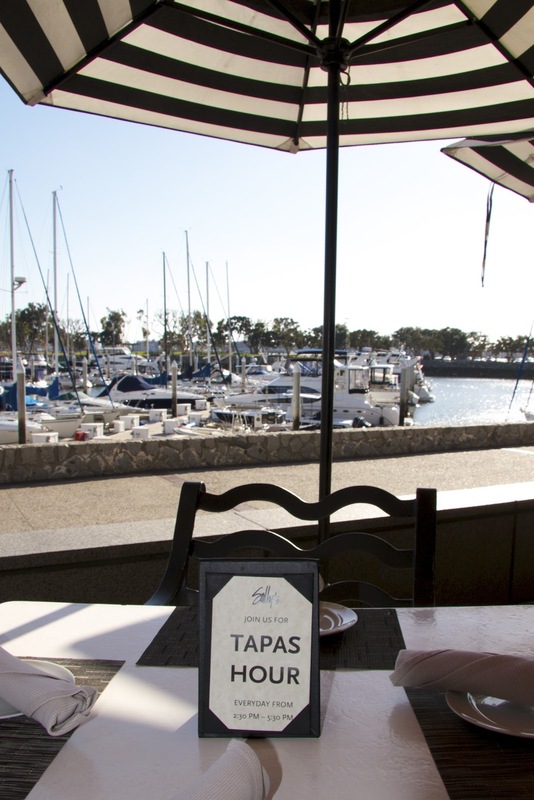 The Galley at the Chula Vista Marina is the place for casual dining. Prices are not outrageous and in general the food is good, the ambiance outstanding and the service relaxed. They also have live music on the weekends. Our first night here we walk over for their Thursday night all you can eat fish and chips for $8.99. The servings are generous and we can’t even finish the first plate. Although not knock your socks off great, it’s decent for the price and we actually order the fish and chips for lunch a few weeks later. We go back a few more times for lunch and breakfast. Their Burgers are quite tasty, breakfast fare is pretty much the usual, ham, eggs, French toast, canned Corned beef hash. For us this is convenience as opposed to fine dining. The South Bay Fish and Grill offers more upscale dining a short walk south along the marina from the Galley. Our first stop there we enjoy afternoon cocktails and appetizers. Their SBF&G Platter of: Kung Pao Calamari, Ceviche and Crab Cake is outstanding and the martini’s pretty much perfect. Our server is attentive but not overly so. Based on our lovely afternoon experience we return another time for dinner. This time, our server is harried and forgetful. We are intrigued by some of the menu items and order the Calamari Rellenos, (a calamari steak stuffed with crab, cheese and pasilla chili.) Although the calamari is tender, there is so little flavor in this dish we can’t help but feel a bit disappointed. In the Seaport area Sally’s has three locations. 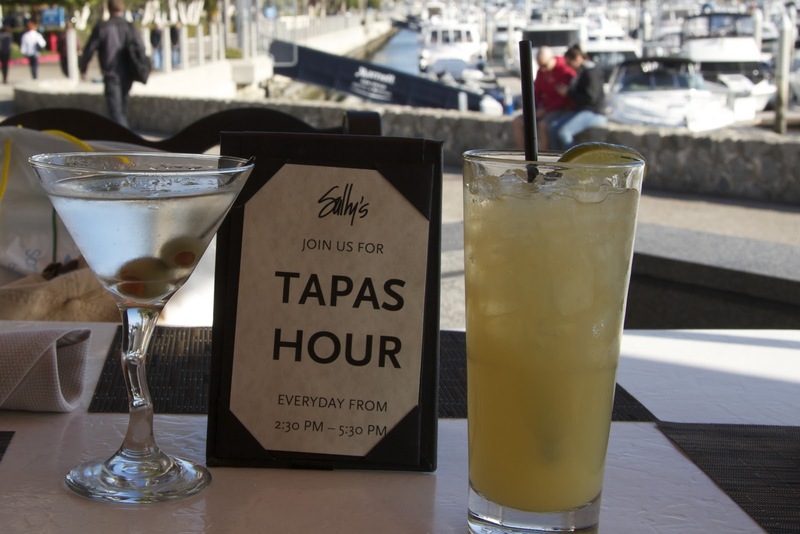 We stop by Sally’s on The Water for their tapas hour. Their outdoor seating provides a wonderful view of the harbor and we can play “snarky fashion police” as the tourists and business folks from the nearby convention center stroll by. We enjoy Spring Rolls, clams and cocktails. The food is tasty and obviously enhanced by the outdoor ambience. Service is good but not outstanding. Overall, it’s just “nice” but not return worthy. A decent place to spend a late afternoon after a morning of shopping and sightseeing. The Fish Market on the waterfront next to the USS Midway offers up and down dining. Up is fine and down is more casual far. There is also a retail counter to purchase fresh seafood to cook at home. The Top of the Market upstairs changes the menu daily based on what their boat brings in. Views from the glass-enclosed patio are stunning and we enjoy a sunset dinner after a day playing tourist. The oyster bar offers a multitude of bivalve varieties including our favorite Kusshi. We start with a half dozen of these on the half shell, an order of their Oysters Rockefeller and a couple of Manhattans. For our main course, Chris orders a wonderful Ink Linguini With Sea Scallops & Prawns sweet peppers, baby shiitake mushrooms, cherry tomatoes, spinach, and Parmesan cream sauce. (This is super yummy!) I opt for the Oregon Dungeness-Crab Cioppino, with Clams, Mussels, Prawns, Fish, Scallops, and Linguini. (Generous portion of crab but heavy on the mussels. It’s really good but the best Cioppino IMO is still found sat Phil’s in Moss Landing, CA.) Portions are generous and we have leftovers for multiple meals back at Dimples. We finish with Tawny port, a Brule trio and a Russian Cream fruit concoction. Our server is prompt and friendly. All in all it’s perfectly wonderful meal in a beautiful location. We go back for lunch a few weeks later. Kusshi oysters are not on this day’s menu so we opt for the Paradise Cove variety. (Good but not quite Kusshi.) Their New England Clam Chowder is thick but not pasty and loaded with clams and just enough potatoes. The Trio of Smoked Fish appetizer falls short – the crostini are stale but the toppings excellent. The Fish and Chips are really good, the fish is thick, juicy, lightly battered and fried to perfection. Their Steamed clams in a light white wine garlic and butter sauce exceptional. Desert is a disappointing key lime pie. On our way out we stop at the retail counter and pick up smoked salmon and Albacore that we continue to enjoy in the following weeks. 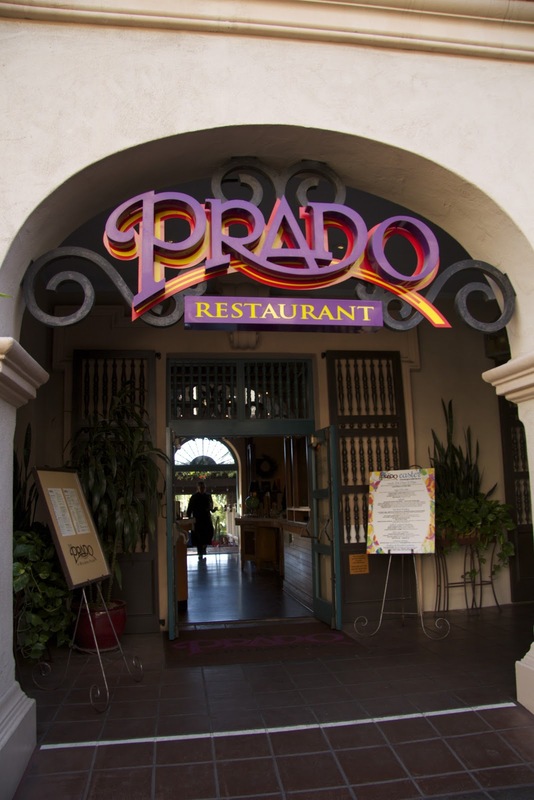 The Prado inside the house of hospitality at Balboa Park is another two-visit restaurant. Afternoon cocktails and spicy calamari fries encourage us to return for a full meal later... Upon our return the Pressed Arugula Salad with strawberries, candied walnuts, asiago and a sherry-shallot vinaigrette is simply wonderful. The grilled fish tacos come “deconstructed.” (A fancy-foodie- buzzword for DYI.) The plate is loaded with perfectly grilled marinated mahi mahi, red cabbage-jicama slaw, mango-jalapeno salsa, mango mustard and corn tortillas. (Enough for a lot of delicious tacos!) Our other entrée, the day’s special: Rock Shrimp Chili Rellenos. This dish falls into the “what were they thinking” category. This is undoubtedly one of the most colorful meals to date. It’s a pink and green phallic fiesta. 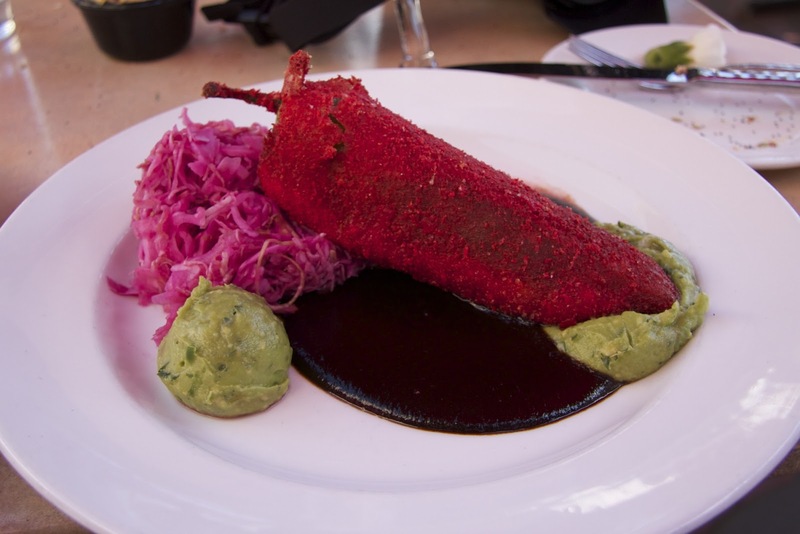 The long bright pink chili sits in a mole sauce surrounded by scoops of guacamole and red cabbage-jicama slaw. The mole sauce by itself is excellent but it fights with the rest of this dish. The chili is a tad tough and slightly bitter because it’s not roasted or peeled as in traditional Chili Rellenos. The bay shrimp (not rock) filling is quite tasty as long as the mole is avoided. Basically this dish should be eaten “deconstructed” as none of the parts compliment the others. Next time we’ll avoid the specials. The Family House of Pancakes in Chula Vista makes some of the best classic breakfasts in town. All portions are huge and most patrons leave with Styrofoam containers of leftovers. Hankering for local Mexican fare we check the urban spoon ratings and dine at El Patio, in Chula Vista. The food is good but where’s the spice? Maybe out taste buds still have a New Mexico sensibility?